What about the spread of Eastern religions and techniques within the West – things like TM, Yoga, the cults? We have moved beyond the counterculture of the sixties, but where to? These elements from the East no longer influence just the beat generation and the dropouts. Now they are fashionable for the middle classes as well. They are everywhere. What has become important is not whether there is anything that causes an experience, but just the experience as such. What about modern theology in the churches? It is the same thing. Maybe the terminology is “Christian,” but the ideas are on the other side – experience is the important thing, not propositions about reality, about God, about salvation and all the rest. It does not matter if anything exists that has caused or conforms to the experience. What about the sudden growth of interest in UFOs and UFOlogy? Even though not a scrap of evidence exists to support Erich von Däniken’s “scientific” theories about spacemen who visited earth in the distant past, millions of people have been taken with these assumptions. He has given his ideas an aura of scientific plausibility, plenty of technical jargon, photographs, and so forth, and because this is a “scientific age,” people are impressed. But the real evidence is unconvincing. Is there conscious life in other parts of the cosmos? We do not know. If there is, it would pose no problem for Christianity. Still, at this time there is no proof at all that this is the case. Why then do people accept it? We suggest it is part of the swing to the irrational. People are hungry for something which will give them hope in life. They are tired of the empty platitudes that politicians and many theologians have made: endless exhortations to be good, to be good, to be good! They are also afraid. Things really do seem hopeless, even on the level of everyday life with its threats of a lower standard of living, of a growing authoritarianism, of famine and ecological disaster, of devastating war. And they are looking for any answer. So the UFOs are messengers of a friendly race from another planet. “Do not fear – the Force is with you!” – to borrow from a current science-fiction film. And so people believe it irrationally. If they used their minds, they would see no evidence for friendly people from outside. But the feeling of experience as they read about this or see it on a screen is enough. It does not matter whether there is any reality to it. What about the growth of occultism, witchcraft, astrology? Is it simply economics that has put the signs of the zodiac in shops from one end of our society to the other? In part it is economics, but, once again, the real reason is deeper. People are looking for answers – answers they can experience. Wherever we look, this is what confronts us: irrational experience. We must be careful not to be bewildered by the surface differences between these movements. We are not saying they are all the same. Of course there are differences. The secular existentialists, for example, disagree with one another. Then, too, secular existentialists differ with religious existentialists; the former tend to be pessimistic, the latter optimistic. Some of the movements are serious and command our respect. Some are just bizarre. There are differences. Yet, all of them represent the new mysticism! The problem with mysticism of this sort is, interestingly enough, the same problem we considered earlier in relation to all humanistic systems. Who is going to say what is right? As soon as one removes the checking mechanism of the mind by which to measure things, everything can then be “right” and everything can also be “wrong.” Eventually, anything and everything can be allowed! Take a simple example from life: If you are asking for directions in a city, you first listen to the directions your guide is giving and then you set off. Let us say the directions are: “Take the first turn on the right, called Twenty-fourth Street; then the next turn of the left, called Kennedy Drive; and then keep going till you come to the park where you will see the concert hall just past a big lake on your right.” Armed with there directions, you go along – checking up on what you have been told: “Yes, there is Twenty-fourth Street. Yes, there is Kennedy Drive,” and so on. In other words, you are not just told words; you are able to see if these words relate to the outside world, the world you have to operate in if you are going to get from A to B. This is where your mind is essential. You can check to see if the information you have been given is true or false. Imagine, on the other hand, that someone said, in answer to your request for directions, “I don’t know where or what B is. It is impossible to talk about a `concert hall.’ What is a `concert hall’ anyway? We can only say of it that it is the `Unknowable. '” How completely ridiculous for you to be told, “Go any way – because this is the way”! Thus, modern man is bombarded from all sides by devotees of this or that experience. The media only compound the problem. So does the commercialism of our highly technological societies. The danger of manipulation from these alone is overwhelming. In the absence of a clear standard, they are a force for the control of people’s minds and behavior that is beyond anything in history. In fact, there are no clear standards in Western society now; and where there is an appearance of standards, very often there is insufficient motivation to lean against the enormous pressures. And why? In part, at least, because there is an inadequate basis for knowledge and for morality. Society can have no stability on this Eastern world-view or its present Western counterpart. It just does not work. And so one finds a gravitation toward some form of authoritarian government, an individual tyrant or group of tyrants who takes the reins of power and rule. And the freedoms, the sorts of freedoms we have enjoyed in the West, are lost. We are, then, brought back to our starting point. The inhumanities and the growing loss of freedoms in the West are the result of a world-view which as no place for “people.” Modern humanistic materialism is an impersonal system. The East is no different. Both begin and end with impersonality. We have looked at reasons for concluding not merely that these world-views are uncomfortable because they lead to inhumanity, but because they are false. They do not fit into what we know best about ourselves and our environment. Ours is a universe which contains real personality. Neither the universe nor this personality is illusory. We will turn now to the Bible’s claim to be the reliable source of information about the universe and mankind. But first, there are two very important introductory comments. Leary, John Lennon, Yoko Ono, and others recording “Give Peace A Chance“. Tyto fotky by vám měly přiblížit nejen to jak Dr. Leary vypadal, ale také něco z jeho povahy. Jsou ale zatím jedinné, které jsem na internetu našel což je taky důvod jejich nekvality. Timothy Leary was a noted Harvard lecturer and researcher who became an advocate for LSD and later an entertainment figure. Born on October 22, 1920, in Springfield, Massachusetts, Timothy Leary forged a career as a noted psychology professor and researcher before becoming a major, highly controversial advocate of psychedelic drugs during the 1960s. He was imprisoned on marijuana charges, yet escaped only to be caught. He later worked in entertainment and cybernetics and published many books. He died on May 31, 1996. Timothy Leary was born on October 22, 1920, in Springfield, Massachusetts, into an Irish-Catholic household. He went on to attend several schools before graduating from the University of Alabama in 1943 and earning a psychology doctorate in 1950 from the University of California at Berkeley. Working there as an assistant professor until 1955, Leary also developed a groundbreaking monograph, published in 1957, which explored interpersonal relationships via a complex model system. Yet Leary and his two children suffered great personal loss during this time period, when his first wife committed suicide. He subsequently worked as the director of the Kaiser Foundation and then accepted a lecturing position at Harvard University in 1959. After taking mushrooms while in Cuernavaca, Mexico, Leary conducted behavioral experiments with psilocybin, an active ingredient of the fungi that was allowed for use in research. He worked with colleagues Richard Alpert and Ralph Metzner, and Leary’s team and affiliated researchers used the drug in studies with seminary students, inmates and colleagues. Leary started to use LSD in the early 1960s. After a scandal when the university discovered students were also using his supply, Leary was discharged in 1963. Becoming an advocate for the use of psychedelic drugs, Leary established the International Foundation for Internal Freedom along with Alpert. Leary later converted to Hinduism after the two established IFIF organizational headquarters in Millbrook, New York, with a rich funder’s support. Leary, known for college lecturing, became a media icon with his much-quoted line, “Turn on, tune in, drop out.” He published his writings, abandoned controlled research methods, and hung out with a number of countercultural and entertainment figures. Yet he faced criticism from various avenues for his role in exhorting youth to take LSD. Richard Nixon dubbed him “the most dangerous man in America,” and both other media personalities and medical professionals decried the palpable damage his message inflicted. After declaring his candidacy for governor of California in 1970, Leary was arrested on marijuana possession charges and received a decade-long jail sentence. He broke free from prison with outside help several months later and traveled abroad before being recaptured in Afghanistan in 1973. He was re-imprisoned and was ultimately released by state governmental decree in 1976. Leary resumed lecturing and, during the ’80s, worked in a number of arts and entertainment jobs, including TV and film roles and stand-up comedy. He turned to tech-oriented pursuits as well, becoming a proponent of virtual-reality programs and helming the software companies Futique, Inc. and Telelctronics. Leary learned in early 1995 that he had terminal cancer, and decided to document his progression toward death via his website, http://www.leary.com. He died on May 31, 1996, in Beverly Hills, California. Matt K. Lewis is a senior contributor to The Daily Caller, and a contributing editor for The Week. He is a respected commentator on politics and cultural issues, and has been cited by major publications such as The Washington Post and The New York Times. Matt is from Myersville, MD and currently resides in Alexandria, VA. Follow Matt K. Lewis on Twitter <a>@mattklewis</a>. Edith Schaeffer, writer and wife of famed Evangelical leader and theologian Francis Schaeffer, died the other week. If you haven’t read her New York Times obituary, it’s an interesting read that also serves to remind us of Francis. This is not to diminish from her many accomplishments. But in many ways, the two were partners. And to read of Edith is to remember Francis. Francis died in 1984, and though he is still highly regarded, his fame pales in comparison to the Billy Grahams of the world. This makes some sense. 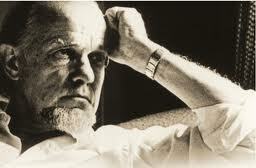 While Graham was holding crusades and Oral Roberts was holding tent revivals or healing services, Schaeffer was holed up in a Swiss commune, giving lectures to hippie elites, writing books. Unfortunately, in recent years, Schaeffer’s name popped up in Ryan Lizza’s controversial profile of Rep. Michele Bachmann. In the process of hitting Bachmann, Lizza captured a less-flattering snapshot of the latter part of Schaeffer’s life. Schaeffer rejected the fundamentalist notion that Christians must separate from the world, instead, insisting that they be in this world, but not of this world. “Essentially he was arriving at a position that said fundamentalism…needs to be more concerned about taking a Gospel message into the culture,” Hankins said. In many ways, that was his legacy. Today I thought I would share an artist that has a direct effect on my art work! 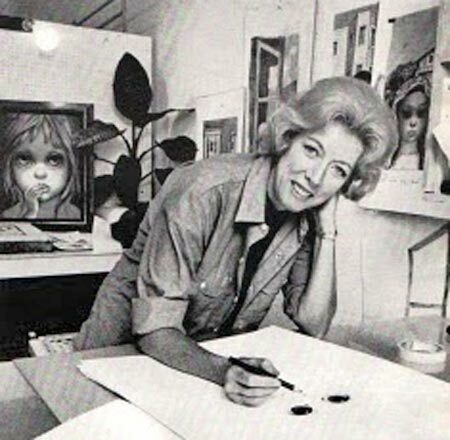 This wonderful painter has been an inspiration to me far before I actually new who she was! From a young age I’ve loved thrift stores, garage sales, and antique stores. 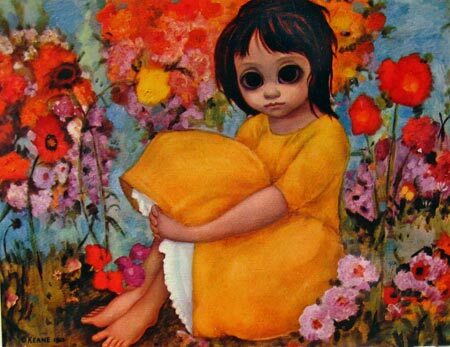 You can find many prints or similar style paintings like Margaret Keane’s in those locations. So I was exposed young to the beauty of big eyes. Those big eyes have always pulled me in and tugged on my heart strings. It’s as if the eyes speak to me. Honestly I feel like a nut saying that, but the eye connection is so strong in some paintings its as close to a conversation as a painting can get for me! So when I started sculpting my art dolls and my process started leading me in this big eye, unrealistic style, I decided to just go with it. I really did try to sculpt realistic faces a few times but it usually just made them look even more alien like! So I stopped fighting what I thought I had to make and embraced what was naturally happening! 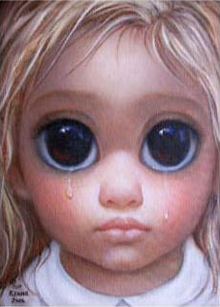 That’s when I started researching other artists who use big eyes and really learnt about Keane’s history. I found it very interesting to know that her husband actually tried claiming he did the paintings! I mean seriously what a poop! So of course when they were getting a divorce in the best way ever she proved the paintings were really hers! She painted out in the open right infront of the judge and everyone to show the work was really hers. So when the husband was asked to do the same “I can’t I have a sore shoulder”. Needless to say, she won the case and has continued to do HER work! As all artist progress and change through their life and career, Keane’s work has experienced shifts of change. 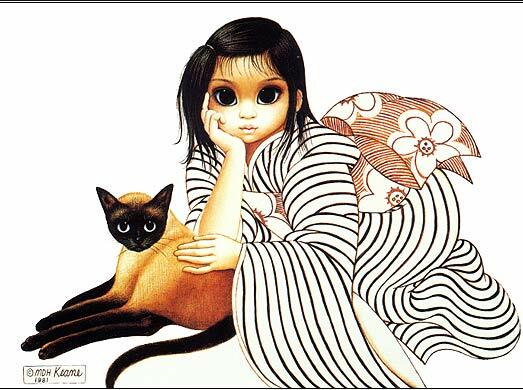 In her early career her characters or style were known as “Big Eyes”, “Sad eyes”, “Waifs” or simply known as “Keane”. Many times a tear graced the characters cheek. However, after the divorce Keane moved to Hawaii and while stylistically the same her paintings became brighter and a bit happier. Then again later in life after joining a church her paintings became even a bit happier. So when a tear graced a face, at that point it was of joy not sadness. Her work was highly criticised in the art world and yet they were some of the best selling art in the Western world in the early 60’s! You may or may not like them yourselves, but there is no denying Keane’s influence on American pop culture! A funny fact for me is that Tim Burton is a long time fan and collector of Keane’s work. Going so far as to commission an art piece, and now working on a movie about her career and court battle with her ex-husband! Although that movie has been talked about for a while, I’m still waiting patiently for something to actually happen with that! I find it funny because I get so many people coming into the gallery saying “this is very Tim Burton like” or referencing him somehow. Which I really don’t mind because I love his work, but in reality I didn’t even consiously think about his work when making mine! I looked at a lot of Keane, Mark Ryden, and Katie Olivias for stylistic inspiration and a myriad of other art doll makers for technical know how. So now seeing that our inspirations crossed paths is a funny little tidbit for me. 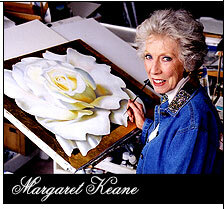 Keane is now located in San Francisco where you can visit Keane Eyes Gallery and see her work first hand. It is by appointment though so don’t be a dummy like me and think you can walk there and go right in. Or you’ll end up peering through the windows like me! Have you seen her work or similar work before? Or have you seen how it has influenced pop culture at all?